If you are like us, you may forget to floss your teeth now and again. The good news is that if you are in this group, the latest information from the departments of Health and Human Services and Agriculture finds it might not matter that much. 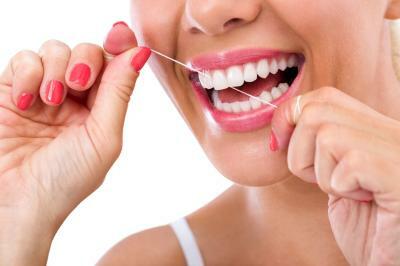 They both concluded that there was evidence that flossing and brushing regularly did appear to reduce gingivitis, but was weak on how much it reduced plaque. So, while it is still a good idea to floss in conjunction with brushing your teeth, missing a day here or there doesn't sound like it may lead to very much of an issue based on the latest research. If you type "dental banking" into Google, you will find some 19mm results inside of 1 second. These include "The Tooth Bank," which appears to be a dental stem cell storage company and a scientific magazine article on how banking your dental pulp (whatever that is), may eventually treat diseases. Many banks we know like to do business with dentists, so we also were not surprised that so many popped up with our quick search. On the first 3 pages alone, these included: Access National Bank ($1.3B, VA), Bank of America $2.2T, NC), Citizens Bank ($145B, RI), Commerce Bank ($24B, KS), First-Citizens Bank & Trust Co ($32B, NC), KeyBank ($96B, OH), NewBridge Bank ($2.8B, NC), Oregon Pacific Bank ($219mm, OR), PNC Bank ($351B, DE), TD Bank ($273B, DE) and US Bank ($423B, OH). Since everyone's search can be different, you will have to do your own, but we certainly found the variety of banking institutions interesting. For us just on these three pages alone, they ranged from $1.3B to $2.2T. The key to dental lending is that it is tied directly to the dentist, so specialized expertise is usually required. Generally, dentists are considered pretty good credit risks though because after all - they go to school for 8Ys and have to get certified at the state and national levels (so they are pretty smart and driven people). Taking a quick look at Bank of America's website (since they were the largest bank), we see they offer a variety of dental practice options. These include new practice loans; practice sales and purchase financing; owner occupied CRE; improvement, expansion and relocation financing; equipment purchases and practice debt consolidation. Just in the new practice loan area, BofA offers loans to cover architectural and design fees, renovation, working capital, low administration fees and interest rate locks. Outside the loan itself, BofA also indicates it offers a dedicated project manager resource to help get things done on time and within budget, along with help for demographic site analysis (to help borrowers select the ideal location and attract a good patient base). As we were in there clicking around, we also saw under their resource tab some interesting help for potential dental practice borrowers. These included such things as: business plans for starting a new practice; business plans for buying an existing practice; top 10 tips for success when starting up a dental practice and top tips for a successful dental practice acquisition. Even more, BofA had layered into the same web site section calculators to help dentists estimate equipment loan payments, upcoming events where staff would be available to answer questions, seminars dates to support customer education, and an FAQ that went into such things as loan terms, approval requirements, specialties and other things. Here, we even found BofA will offer maximum loan amounts up to $5mm for dental practices. We thought those of you who lend in this sector might enjoy a checkup. Yields tumbled 5bp after the release of disappointing economic data on retail sales and whole sale prices. A KPMG survey of large bank executives finds 39% consider fintechs a significant threat to the industry in the next few years, while 31% do not and 30% are not sure. An RMA survey finds bankers say the liquidity risk metrics approved by their board are: liquidity ratio (72%), net loans to deposits (62%), and brokered deposits to total deposits (51%). A Compensation Advisors survey of bank executives finds only 33% of respondents say they have a plan in place to attract millennials. Korn Ferry warns that "over finite periods of time, relative TSR performance results can be extremely volatile," so it is "important to understand how your company performs vs. a broader index, sub-index or custom peer group." The Treasury has proposed new limits around how business owners transfer assets to heirs without paying estate or gift taxes. The new regulations focus on the practice of discounting the value of ownership stakes in closely held businesses (known as valuation discounts, or fractional interests). Research by BI Intelligence finds about 20% of total time spent online in the US is spent on social platforms. A survey by Bank Director finds the primary compensation challenges respondents say they are facing this year are: trying to compensate for performance (46%), recruiting commercial lenders (40%), compensation and benefit costs (40%), retaining key people (27%), competitive pay (25%) and recruiting younger talent (23%). A Compensation Advisors survey of executives at privately held banks finds 71% of respondents say they do not receive equity grants.